If a graphical environment is supported, an AWT window is displayed where the available system properties are listed (see figure). You can send the properties directly to our web service using the "Submit" button (preferred). An Internet connection is required to do so. Alternatively, the property file can be stored locally and then uploaded using our web form (see below). This is useful if the target machine is not connected to the Internet. 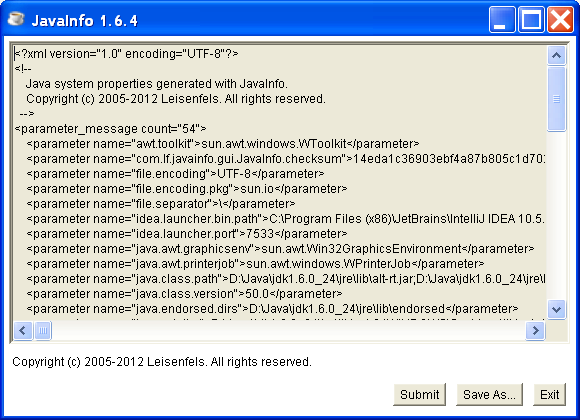 The following list shows the possible ways to execute the JavaInfo application which is different for older Java versions like the JRE 1.1. For Windows Java versions it is also possible to double-click the JAR file from the Windows Explorer to start the application. The GUI mode is activated by default if a GUI is available which is the case on most platforms. If you start the application and see nothing then possible your system lacks GUI support. Try to start the application without GUI as described below in such cases.